Crystal Card Holders. 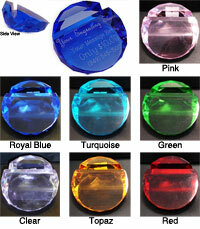 Pretty glass business card holders can be left just as they are or you can get them engraved. Each measures approx 4" diam x 1.5" thick. To order plain holders, buy from us. To order engraved holders, email:erin@yourengravingstore.com or call them at 949-545-1500. They will furnish these same crystal card holders but with your choice of engraving. Engraved card holders are $32 each.